Few things are as over-built as our 360° shoot houses. We don't believe you can over-build for safety or durability! Our unconventional use of steel plating results in shoot houses that are virtually indestructible and allow multiple live-fire teams to operate simultaneously in different rooms safely, without rounds fired by one team reaching another. This unique, overlapping steel-bolted-to-steel design eliminates gaps and contains every ounce of splatter wherever the shooting takes place. You will find the same quality of construction in the doors and windows, which can be made bulletproof. We can customize the interiors with hallways, offices, bedrooms, bathrooms - anything that helps simulate an operational setting. Once erected, you can install target systems to create the most realistic instructional environment possible. The modular design even provides the option of changing the floor plan in the future, or if needed, moving the facility to a different location. Safety, durability and flexibility! Three reasons why Savage Range Systems shoot houses are the superior choice. Quality, strength and durability are built into every house. 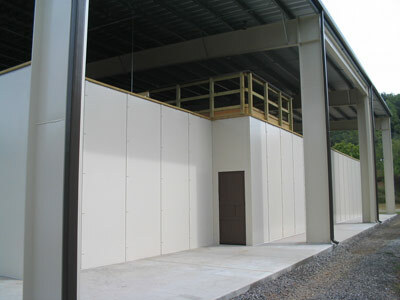 All shoot house walls are 4' wide, framed with 2" x 4"s and can be either 8', 10' or 12' high. All seams overlap by at least 3". All steel is 3/8" thick with a Brinell Scale rating exceeding 510. All doors and windows, inside and out, can have ballistic shields. All offer a mechanical breaching door option designed to withstand manually operated forcible entry tools. All shooting houses are built upon solid concrete foundations. All houses are indestructible when used properly. All houses begin by calling 413-642-4113. Two steel plates are butted together, then overlapped with a 3" wide steel plate on both sides of the seam. This interconnecting design makes the walls impenetrable. The inside of the seam is then framed with 2" x 4"s and covered with a 1/2" plywood sheet, rubber tile, or conveyor belting. 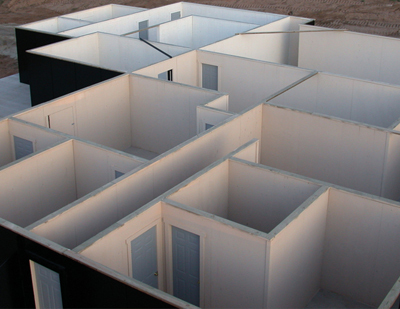 Except for the seams, they're identical to exterior walls. Seams are covered both front and back with 2" x 4"s and plywood, rubber tiles or conveyor belting. When a bullet strikes a wall, it penetrates the anti-ricochet covering and disintegrates against the steel where the fragments are trapped. When an area of anti-ricochet covering is shot out, simply replace the effected area. 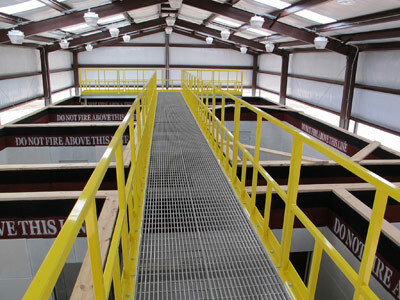 The overhead walkway option comes with an exterior stairway that leads up to a railed walkway, level with the tops of the walls, allowing a clear view of the room below. It attaches to the modular joint sections and meets OSHA standards. The roof option is an engineered pole barn, with a galvalume roofing system and can be built to withstand up to 130 mph wind load. 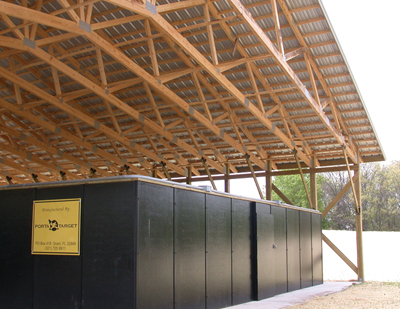 With the pole barn system, trusses are manufactured by a local supplier, ensuring everything meets local wind and snow load requirements. This system also provides full-flow ventilation throughout the shoot house. Specifically designed for use in and around shoot houses. 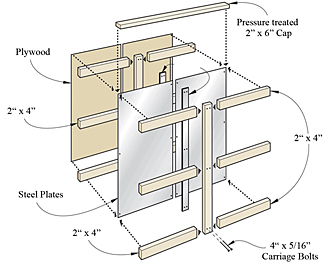 Two 2" x 4"s support a 3/8" thick Rifle Grade steel sheet covered with a 1/2" plywood sheet. A 1 1/2" air-gap, similar to those on our shoot house walls, traps fragments between layers. Available in stationary or mobile versions.